Candy Canes arehard cane-shaped sticks of candy. They are traditionally white with red stripes and peppermint flavored, although other colors and flavors are sometimes used. One legend states that a choirmaster bent straight sugar sticks into the shape of shepherd's crooks, and gave them to children at Christmas time. 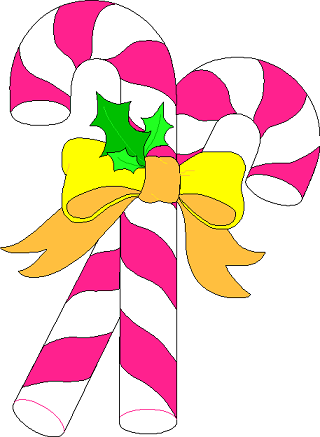 Another legend says that a candymaker in Indiana made Candy Canes as a symbol of the birth, ministry and death of Jesus Christ. The candymaker began with white hard candy. White symbolizes the Virgin Birth and sinless nature of Christ, and the hardness symbolizes the Solid Rock, the foundation of the Church, and the firm promises of God. The shape of the candy, a letter "J" represents the name of Jesus, and also represents the staff of the "Good Shepherd". The red stripes represents the blood shed by Jesus on the cross so that we could have eternal life. Although very widely repeated, this particular legend seems unlikely to be true This is because Candy Canes are known to have originated in Europe, long before the creation of Indiana or the United States of America. As for being a secret sign used by Christians to avoid persecution, this also seems unlikely. Europe has been overwhelmingly Christian for many centuries, so it is very unlikely that Christian's would have needed a secret symbol to avoid persecution. In any case, whatever the origin of Candy Canes, they look great and taste delicious!